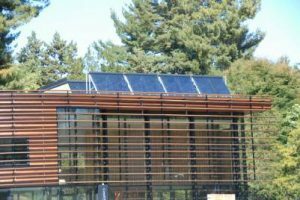 In September of 2009 SunMaxx Solar was pleased to be selected to provide the evacuated tubes for the Brian C. Nevin Welcome Center on the Cornell University Campus. Under the direction of M/E Engineering, who were responsible for the mechanical design, the welcome center used 8 ThermoPower-VHP30 evacuated tubes from SunMaxx Solar on the roof of the Welcome Center. “The collectors are connected to the building’s heating water system. The heating system for the building is primary in floor hot water radiant heat. “ according to Chad Fikes of M./E Engineering. Once completed the system was reviewed by Intelligent Green Solutions (IGS), a preferred SunMaxx Solar Installer. It was determined that the system not only proved cost-effective but utilized the highest level of components and HVAC plumbing, and electrical craftsmanship. IGS was very pleased with the set up of the system and with a few minor adjustments they were ready to commission the solar thermal system. The Brian C. Nevin Welcome Center “ has a goal of being an exemplary green garden by being environmentally progressive in our practices and operations.” according to Don Rakow, The E. N. Wilds Director, Cornell Plantations. The Nevin Welcome Center has shown itself to be a leader in environmental direction. The facility is expecting to receive a LEED (Leadership in Energy & Environmental Design) Gold certification and even possibly a LEED Platinum certification, from the U.S. Green Building Council. For more information, please visit SunMaxx Solar online at www.sunmaxxsolar.com, or contact a SunMaxx Solar thermal specialist at 1.877.786.6299. For more information on Nevin Welcome Center please visit http://www.cornellplantations.org/about/welcome-center.